The process of creating and exhibiting art is different for every artist. The location of an art show influences what is displayed, as well as how it is hung. Preparation for an exhibition may be part of the artist’s usual routine or be a focused, intense period of work. It is as individual as the artist and the circumstance. Max Decker grew up on the Island and graduated from the Museum School in Boston. He currently spends most of the year in Brooklyn, where he focuses most of his energy on music, while he also continues to paint. “It was easier to paint when I had a loft,” says Mr. Decker. 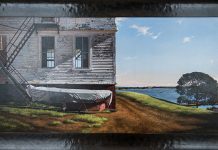 “I find it hard to paint when I’m sitting in a basement, although I do some urban-oriented painting.” On the Vineyard he works on his landscape paintings and urban scenes in a large studio next to his family home in West Tisbury. He will arrive here with a month to focus exclusively on painting in preparation for his September show at PikNik Fine Arts & Apparel gallery in Oak Bluffs. Ken Vincent is another art school graduate and West Tisbury native. He studied at Rhode Island School of Design (RISD) where he earned a BFA in illustration in 1999. Since then he has been building his career as a children’s book illustrator and painter. 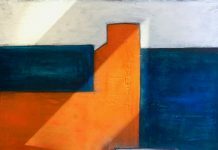 His Island land- and sea-scapes are composed of slightly abstracted blocks and planes of saturated color. His work is currently showing at the Granary Gallery. Debra Gaines’ career in art actually began out of a desire to spend more time with her growing family — she has three children. She left a steady but inflexible job at the post office to show and promote her brother-in-law’s art. After a decade of selling Dana Gaines’ cards and prints at flea markets and artisans’ shows, Ms. Gaines began to work on her own art. She completed a three-year program in digital photography at RISD while she continued to manage a home-based art business for herself and other members of the Gaines family. She had her own gallery in Edgartown for two years, but found that it was better to do the summer shows and sell through her website, debragaines.com. On August 21 her show will open at the Old Sculpin Gallery in Edgartown. Ruth Kirchmeier is a long-established Island woodcut artist. She studied at Pratt Institute in Brooklyn and The Cooper Union School of Art, in New York City. Now in her 70s, she works on her woodcuts throughout the year. “My work is labor-intensive,” she says. 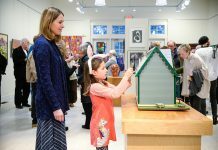 It begins with making a drawing in her West Tisbury studio, which she then traces onto a block of wood. She carves the master plate then transfers the drawing to two more sides of the block. Then, she works to get the colors right. When it comes to hanging the work, she leaves it up to the gallery owners. She shows at Hermine Merel Smith Fine Art in West Tisbury and at the Shaw Cramer Gallery in Vineyard Haven.